If you decide to follow a vegetarian diet or follow a healthy diet that the diet remains balanced, you have to know which plant foods have the most protein. Protein plays a crucial role in the formation of muscle tissue needed for the skin and bones. First place in protein is legumes. Soy, beans, peas, lentils rich sources of highly absorbable by the body vegetable protein. These products reduce the level of cholesterol in the blood, contain large amounts of vitamins and minerals. Soybean nutrient can replace meat products. 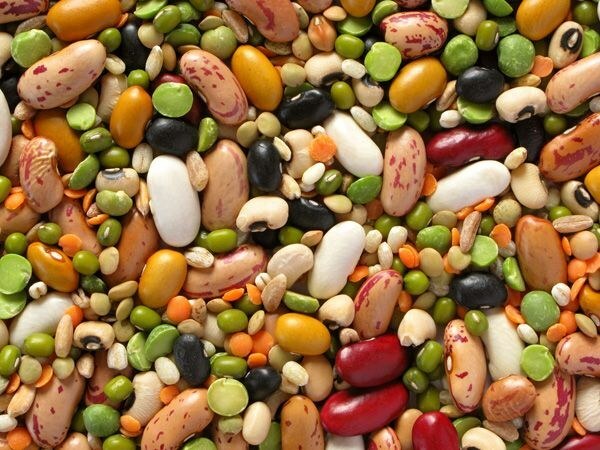 In addition, beans contain soluble fiber, which normalizes metabolism. One of the products derived from soy milk is tofu, which is a source of calcium and iron. Nuts. Most vegetable protein is found in peanuts, sunflower seeds, hazelnuts, almonds, walnuts. In addition protein nuts contain healthy fats and a large amount of essential amino acids. Eating small amounts of nuts several times a week has a beneficial effect on the brain, which is especially useful for pupils and students. However, if you use this product with caution because nuts are high in calories and can cause allergic reactions. Cereals. Buckwheat, millet, rice, oats, semolina. In addition to protein these cereals contain complex carbohydrates that give a feeling of satiety for a long time. Cereals have a high nutritional value, contain fiber, which has beneficial effects on metabolism and revitalizes the digestive tract. Cereals are rich in vitamins, minerals and amino acids. Able to quickly restore the lost strength of the person. People controlling body weight, it is recommended to include in your diet buckwheat, oats and rice. They are less caloric than, say, semolina. Broccoli. Contains more protein than all other types of cabbage. In addition, broccoli is rich in vitamins A, E, C, b, PP. Contains large amounts of essential minerals. This cabbage restores the water-salt balance in the body, normalizes the functioning of systems and organs, helps rid the body of toxins, protects the body from viruses and infections and even prevents the appearance of cellulite. Spinach. Is one of the most useful products of plant origin. Substances contained in spinach, can purify and restore the body. Spinach is beneficial for pregnant women and children due to the fact that it contains all the necessary substances. This vegetable is well absorbed by the body and helps to quickly restore power after an active physical labor. Spinach is useful for people of any age and prevents the development of blindness.